I am always puzzled when I see bloggers declaim against those who try out and post recipes from other sources. It just feels kind of snobbish to me. Most, if not all food people read recipes. Food people tend to read a lot of recipes. Food people tend to own a lot of cookbooks too. A lot of food people also watch a lot of food TV. This is not uncommon, and it strikes me as strangely inauthentic when people deny it. Furthermore, what’s so bad about it? Trying recipes from other people is a good way to learn different cooking techniques. Blogging about your experience lets others learn from you, just like you learned from them. Don’t you like the feeling that you are joining and contributing to the larger conversation? I do. Also, there are a lot of recipes out there. What’s wrong with bringing some of those to the attention of another audience? I mean, don’t go out and plagiarize. Don’t pass off recipes that are not yours as your own. But why look down on people who properly attribute and discuss their results? We all blog and write because we generally want to share our knowledge and experience. I personally would be thrilled if someone made and wrote about something that I posted so long as they did it respectfully — and I think that most bloggers would be pretty darn chuffed too. Yeah, I know. I just used a British-ism. More importantly, if you are trying your hand at writing recipes, looking at other sources is a great way to learn how to order ingredients and write directions in a way that is clear, concise, and consistent. Recipe writing is like any other kind of writing: you get better the more you do it, and the more you read. To those who think that their recipes are completely original, well, please excuse my bluntness, but hardly any recipes are really original nowadays unless you are some molecular gastronomist making perfectly good food into weird foamy, jellied things. Furthermore, no one I know who cooks ever sticks to any recipe as published anyway. I’ll confess: most of the time, I don’t. I’ll breezily skim the ingredients list, and cockily cook them in the order and manner that I feel works best, passing on anything that sounds untasty to me, and adding anything that I feel was an egregious omission. How’s that for food snobbery? Pshaw, I remember thinking. Not quite hogwash, but I had blended tons of thick soups, all at once without incident. I certainly wasn’t going to alter my MO now. Then I remember the blender’s lid flying off — just like TV Tony said it would — and the kitchen being sprayed with hot soup and spongy bits of mushroom. After cleaning everything up, I made a mental note to always read recipes straight through before cooking, and always respect any warnings the recipe writer may give. I learned the messy way that recipe writers do not write warnings for their benefit, but ours. If Bourdain was making a point to tell me to keep a tight lock on the blender, it’s because he very likely sprayed his kitchen with mushroom soup too, cursing the other cookbook writer who failed to mention in their recipe to keep a hold on the blender lid while blending. If you love mushrooms, this soup is not only super easy, but very, very delicious. The original recipe calls for onions, but I always prefer the ultimate combo of butter, shallots, and booze — which is one of the ways I adapted his recipe. Be sure to use a good sherry, not a cooking sherry for the soup. If you have time, you can roast a couple shitake mushrooms in the oven for garnish. I accidentally left mine in the oven for too long, ending up with mushroom chips that taste (amazingly) just like bacon. No complaints here! I also use an immersion blender now, so no more flying blender lids for me! 1. In a large Dutch oven, melt two tablespoons of the butter with a little bit of olive oil over medium heat. Add the shallots and thyme. Keep track of how many sprigs of thyme you add so you know how many stems you need to remove before puréeing the soup. Sauté the shallots until they begin to turn translucent. 2. Add the mushrooms and the remaining 2 tablespoons of butter. Let the mixture sweat for about 6-8 minutes. The mushrooms should begin to give up most of their liquid at this point. Be careful to not let the shallots brown. Season with salt and pepper. Add the stock, and bring everything up to a boil. Reduce the temperature, and simmer the soup covered for about an hour. 3. After an hour, remove the stems of the thyme sprigs. Using an immersion blender, carefully purée the soup. Adjust the seasoning. Bring the soup back up to a simmer and mix in the sherry. You want to just simmer the soup long enough enough to cook off the alcohol in the sherry. Serve immediately with some good bread. Baking soda, baby! Baking soda! One day, when I was at NECI, there was an older, married female student She was in the corner of the kitchen crying and obviously very upset. She had spent a great deal of money to attend NECI and had even relocated her family to Vermont. The French Chef Instructor who was in charge of the classroom/kitchen that day went over to her to find out what was wrong. The French Chef Instructor said (with no empathy whatsoever in his voice), “We do not teach recipes. We teach techniques and principles.” He walked away and resumed teaching class. The woman continued to cry in the corner. He ignored her. What is the point of my comment? I’m not sure. I know I was shocked when I heard the Chef say that but then I went out into the real world of food service and learned that recipes are great but they are not all that important. A great chef knows how to improvise, substitute, fake it, make mistakes and fix them……..all within a tight budget and a crazy time limit. Most food snobs don’t know squat about stuff like that. Seriously, they don’t. Ignore the food snobs. You owe it to yourself to do that. That poor woman. It’s so hard when your expectations don’t match up with reality. It’s also true that the point of culinary school is to teach you technique, not recipes. Even Escoffier’s Le Guide Culinaire was less of a recipe book and more a quick reference with just ingredients and ratios and no instructions. It was just suppose to jog your memory if you had forgotten what goes in this or that dish. It’s funny; I didn’t start this blog to be a better cook, but a better writer. Until I started my dissertation, almost all the writing that I did was in French. Suddenly, faced with the prospect of writing the diss in a language that I hadn’t used academically since college, I was terrified. My English writing, besides emailing friends, was like an unsophisticated time capsule! Learning how to write recipes well is a skill. I read a lot of very poorly written recipes (least liked phrase? “set it aside”), and as a teacher, I really wanted a chance to try to improve on that model. I think my point is that there is a lot of ego in food, regardless if you are a professional or not. I think that I just got a little tired of reading people make snide comments about how they only post recipes they came up with themselves! No one lives in a vacuum, and isn’t it more important to write and cook from the heart than toot your foodie supremacy? Yes, there are super big egos in the food industry. Some of the people are entitled to have an over inflated ego, most are not. Unique recipes that are completely original? Ummmm….I doubt it. People who say stuff like that need a serious reality check. I think the only situation where someone could really say that is if they were working with an unusual product like emu, ostrich eggs, etc. I agree, too, that many modern recipes are very poorly written. Recipe writing is part art/ part science. Few modern cooks have mastered it. I love your blog because it is executed well. Directions are clear and to the point. The pictures are very professional. Plus, you cover a range of cuisines which is refreshing. Seriously, you should think about getting a tv show. I think you would be a big hit! You have a lot to offer people. Ever think about getting your own You Tube channel? Aww, thank you! I love your blog too! I think that there is one thing that ties all the blogs that I follow together: those bloggers (yourself included) are great writers with clear and strong writing voices. I definitely get inspired reading your blog, and am glad we met through this crazy wordpress world! I like to think some of my recipes are original, but everything I have learned to get up to the point of writing something is a amalgamation of everything I have seen and eaten. It’s totally plausible that someone else somewhere came up with the same or similar flavour combinations on their own too. I don’t think I have ever followed a recipe exactly as written. When I’m researching what to do with an unfamiliar ingredient, I usually read a bunch of recipes, and take in the easiest ones and do something in the vein of those. I try to write warnings in my recipes (or in the post proceeding the recipe). Especially when people might be tempted to do something they shouldn’t…Like like the stirring spoon of bubbling butterscotch. Don’t do it. No matter how delicious it smells. I love mushrooms and I love Bourdain. In fact, I just read one of his articles at lunchtime. How fitting. 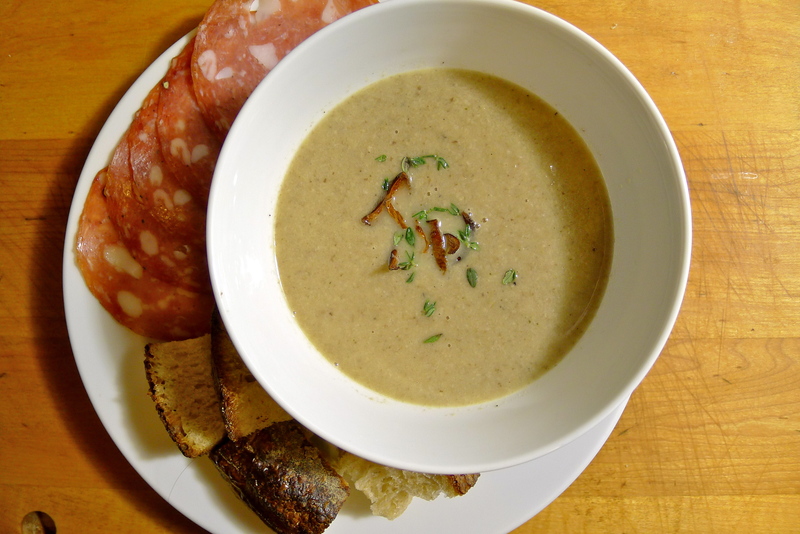 Another mushroom soup recipe I loved was Elia’s mushroom soup from Top Chef. Look it up. It’s divine. I had to make it as soon as I watched that episode. That’s what I do too! Sometimes I get a germ of an idea and I start my research from there. I look at a bunch of different recipes, and look up all kinds of stuff about different techniques and tricks. I agree. I don’t know if it’s possible to avoid being inspired by what you eat and what you see. I actually didn’t mean to imply in my post that coming up with your own thing is a bad thing. It’s awesome to have a dish to call your own! I was just responding to this other blog I read where the person made a kind of big deal about how they didn’t like people who post about making recipes from epicurious.com. I’m not naming names, but it was so snotty! Warnings are definitely a good thing. Reading a lot before cooking certainly has saved me from kitchen disasters. That hot butterscotch thing you mentioned? Been there, done it . . . with caramel! Worse! Am going to look up that mushroom soup. The great thing about food? There are a million different ways to make something! Just looked up Elia’s recipe. Wow. 4 cups of heavy cream. I also thought it was interesting that she strained out the mushrooms and discarded them. So the cream is just infused with the mushroom flavor? I would have kept the mushrooms! But I like the idea of walnuts. It’s like a forest theme going on. Gives me an idea for toasted walnuts and WALNUT OIL DRIZZLE! Yum! Yeah, I’ve only made that recipe once but it was delicious. I guess that much cream makes it taste amazing. I actually enjoy chunky soups, but mushrooms are kind of spongey in soups. It sounds delicious! Okay, I’m going to try it. Go heavy cream!!! It is! Mushrooms and sherry always feel comforting and warming when the weather is chilly. The original recipe called for an extra two tablespoons of butter (6 total! ), if that helps nudge you further! haha “I just used a british-ism”. must be all the british food blogs you’re reading 😉 saw you at susan’s. great point about the food snobs. honestly, food is meant to be enjoyed and loved by everyone. there’s no point in tracing the origin of recipes because all recipes are inspired by others. anyway, thanks for sharing the recipe, the soup looks delicious! I agree! Thanks for the comment, and, yeah, those British-isms definitely sneak in there and stick! Itws my first reply in your fab’ house of food. Bourdain is one of my idles! I absolutely love with that guy! So I guess this recipe is the right one to start in your blog for me. Thanks for the great recipe (I’m just shocked that Anthony doesn’t put some 10oz of bacon in there ;))! I will visit here often from now on. Thanks for the visit and for the nice comment! Bourdain is a very funny guy indeed. I always wonder what celebrity chefs ever goof up because I think that they have to mess up something sometimes because no one is perfect all the time!